Antinuclear protest movements sprang up in and around Tokyo after the Great East Japan Earthquake and tsunami of March 11, 2011. Japan’s antinuclear movement has since waned, however, and the reasons warrant careful consideration. The antinuclear movement in Japan before 3.11 focused on opposition to nuclear arms, led by Gensuikyo—formally the Gensuibaku Kinshi Nihon Kyogikai (Japan Council against Atomic and Hydrogen Bombs). That group emerged in response to the open-air nuclear detonation conducted by the United States on Bikini Atoll on March 1, 1954. It subsequently succumbed, though, to the factionalism for which Japan’s political left is notorious. Numerous progressives who opposed nuclear arms supported the use of nuclear power. That includes even members of support organizations for the hibakusha victims of the Hiroshima and Nagasaki nuclear bombings. Opposition to nuclear power plants arose in some plant localities, but that opposition centered on fishing and land rights and did not necessarily reflect concern about the dangers of nuclear catastrophe. The nuclear accident at Chernobyl in 1986 occasioned an upturn in antinuclear sentiment in Japan, but the antinuclear activists failed to attain sufficient collective heft to sway national policy significantly. They gathered tens of thousands of signatures for a petition that called for curtailing dependence on nuclear energy, but the Japanese constitution lacks any provision for legally binding citizen-initiated referendums. Meanwhile, the continuing election and re-election of parliamentary candidates from the Liberal Democratic Party (LDP) calls into question the depth of popular opposition to nuclear power. The conservative LDP, which has dominated postwar Japanese politics, has been and remains a vigorous proponent of nuclear power. The antinuclear movement that formed after 3.11 differed from its predecessors in that it was organic, not political. 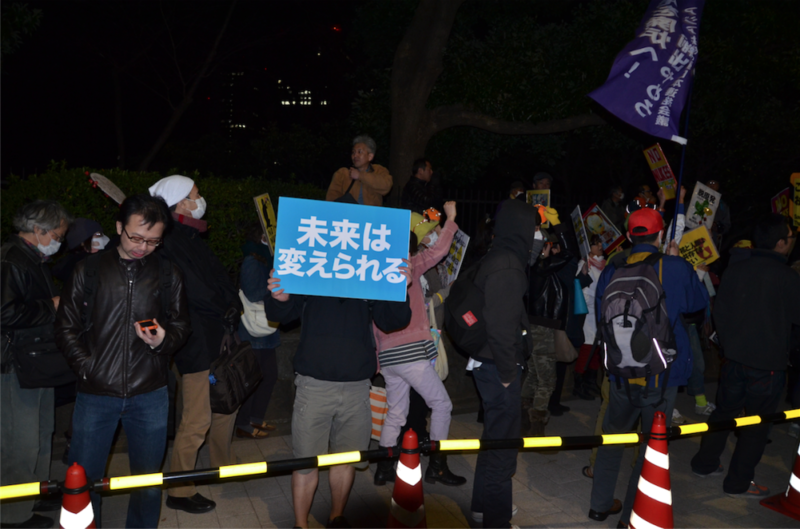 Protests outside the prime minister’s residence, the parliament building, and Tokyo Electric Power Company’s headquarters became weekly events. On July 16, 2012, more than 170,000 antinuclear protesters congregated in Tokyo’s Yoyogi Park—Japan’s largest antinuclear gathering ever. The ruling Democratic Party of Japan (DPJ) differed little from the LDP in regard to nuclear energy policy. Kan Naoto, the prime minister when the disaster occurred, expressed concerns about nuclear power, but his DPJ successor as prime minister, former finance minister Noda Yoshihiko, announced his wish to restart all nuclear power plants as soon as possible after finishing rigorous safety inspections. Japan’s antinuclear movement gained a face when Noda agreed to meet with representatives of the Metropolitan Coalition against Nukes (Hangenren). Interestingly, no evidence is available that suggests that Hangenren had indeed been in the vanguard of the antinuclear protests. But that did not prevent the mass media from portraying its leaders as “representatives” of the antinuclear movement. And Hangenren’s emergence as the face of the movement proved fateful. Social movements decline for any of four main reasons: cooptation, repression, organizational failure, and absorption into mainstream society. Positioning the Hangenren as the face of the antinuclear movement enabled the authorities to coopt the movement. Now in the limelight as the newly christened organizers of the weekly protests, Hangenren colluded with the police. The policy became obvious as Hangenren organizers, positioned behind shields of riot police, and used police bullhorns to control the masses. Here were “protesters” abiding politely by traffic rules. The mainstream domestic media threw its support behind the cooptation policy, characterizing the nonaligned antinuclear activists as ultraleftist radicals. And the antinuclear movement declined into insignificance as a force for change. We could argue, of course, that the decline of Japan’s post-3.11 antinuclear movement is a reflection of the movement’s success: that its agenda has gone mainstream. Reinforcing that argument are the findings of a recent Asahi Shimbun poll. That poll revealed that 58 percent of Japanese are in favor of moving away from nuclear energy dependence as soon as possible. The Japanese Communist Party (JCP) noted on its website, meanwhile, the gains by the JCP and by other antinuclear parties in a recent election for seats to the upper house in Japan’s parliament. Japan’s pronuclear business establishment is stronger, however, than public sentiment. Its propaganda exalts the safety and necessity of nuclear power plants and the importance of nuclear technology. The business-friendly magazine Wedge recently carried an extended feature that called for restarting all of Japan’s nuclear power plants. Establishment propaganda also mobilizes pop-culture icons to extol the safety of nuclear power. Nuclear reactors power the lovable robotic cat Doraemon and the Gundam robots in Japanese cartoons. The popularity of the nuclear-powered robotic heroes is emblematic of the obstacles that the antinuclear movement faces. Adults who grow up with deeply ingrained notions of nuclear safety tend to cling stubbornly to those notions as adults. The Japanese government, which has taken a majority stake in Tokyo Electric, is working towards restarting the nation’s nuclear reactors. Tokyo Electric is moving to restart up to four nuclear reactors by 2015, starting with the Kashiwazaki Nuclear Power Plant in Niigata in July 2014. That would seem to negate the efforts of the thousands of antinuclear activists who rallied day and night after 3.11. But it does not mean that the post-3.11 antinuclear movement has been an utter failure. A reasonable goal for any social movement is to awaken the general public, to incite change. In that sense, the post-3.11 antinuclear movement has been highly successful. Never has such a movement in Japan swayed public opinion as much as this one has. Notwithstanding the establishment’s cooptation of the movement through Hangenren or even the projected restarting of reactors, the antinuclear movement has accomplished a great deal. Let us be grateful for its role in arousing a broadened public discourse about the direction of Japanese energy policy. Douglas Miller is a public relations consultant, translator, and interpreter living and working in Tokyo. He is currently pursuing a B.A. in Political Science at Temple University.